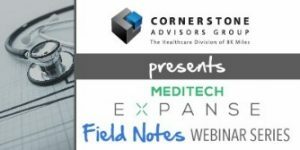 About Cornerstone’s “MEDITECH Expanse Field Notes” This webinar series provides 45-minute, online educational sessions designed to provide useful content to enhance your Expanse implementation and optimization, and will keep you informed on the newest additions to MEDITECH’s web-based EHR platform. Each webinar will examine and dive deep into a specific element of Expanse, led by the Cornerstone experts. Registration is free, but required. Register for A Physician’s View: Physician Documentation here.